Have you ever found a brown, Styrofoam-like mass on a shrub in your garden? As the leaves begin to fall in autumn, people often find these odd-looking formations on their garden plants and wonder what they are. Many people guess that it's a cocoon of some kind. Although this is a sign of insect activity, it's not a cocoon. 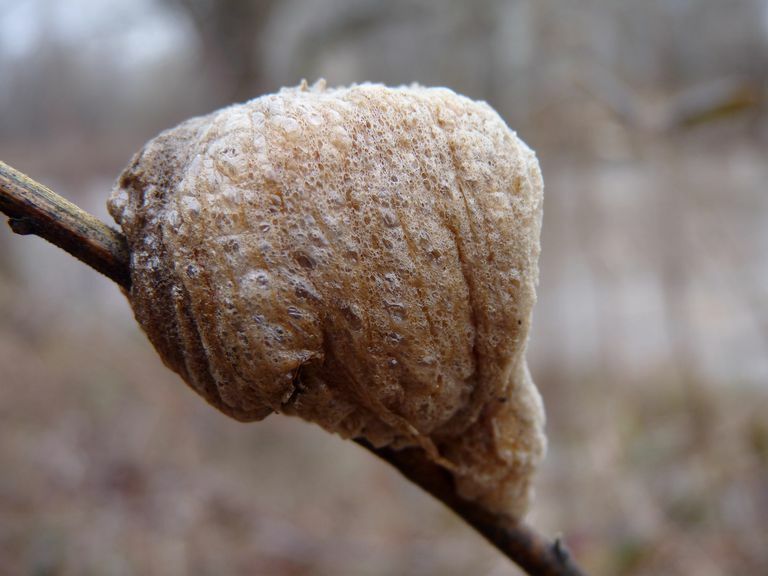 This foamy structure is the egg case of a praying mantis. Soon after mating, a female praying mantis deposits a mass of eggs on a twig or other suitable structure. She may lay just a few dozen eggs or as many as four hundred at one time. Using special accessory glands on her abdomen, the mother mantid then covers her eggs with a frothy substance, which hardens quickly to a consistency similar to Styrofoam. This egg case is called an ootheca. A single female mantid may produce several oothecae (the plural of ootheca) after mating just once. Praying mantids typically lay their eggs in late summer or fall, and the young develop within the ootheca over the winter months. The foamy case insulates the offspring from the cold and provides them with some protection from predators. Tiny mantid nymphs hatch from their eggs while still inside the egg case. Depending on environmental variables and the species, the nymphs may take 3-6 months to emerge from the ootheca. In spring or early summer, the young mantids make their way out of the protective foam case, hungry and ready to hunt other small invertebrates. They immediately begin to disperse in search of food. If you find an ootheca in the fall or winter, you may be tempted to bring it indoors. Be forewarned that the warmth of your home will feel like spring to the baby mantids waiting to emerge! You probably don't want 400 miniature mantids running up your walls. If you do collect an ootheca in the hope of watching it hatch, keep it in your refrigerator to simulate winter temperatures, or better yet, in an unheated shed or detached garage. When spring arrives, you can place the ootheca in a terrarium or box to observe the emergence. But don't keep the young nymphs confined. They emerge in hunting mode and will eat their siblings without hesitation. Let them disperse in your garden, where they will help with pest control. It's usually possible to identify the mantid species by its egg case. If you're interested in identifying mantid egg cases you find, includes photographs of the most common mantid oothecae found in North America. The egg case shown above is from a Chinese mantid (Tenodera sinensis sinensis). This species is a native of China and other parts of Asia but is well-established in North America. Commercial biocontrol suppliers sell Chinese mantid egg cases to gardeners and nurseries who want to use mantids for pest control. Praying Mantid Care Sheet, Amateur Entomologists' Society website. Accessed online September 15, 2014. 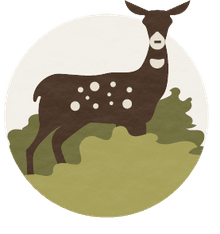 Ootheca, Amateur Entomologists' Society website. Accessed online September 15, 2014. Carolina Mantid Ootheca, North Carolina Museum of Natural Sciences, website. Accessed online September 15, 2014. Ootheca, Museum Victoria website. Accessed online September 15, 2014. Subspecies Tenodera sinensis sinensis - Chinese Mantis, Bugguide.net. Accessed online September 15, 2014. Does a Praying Mantis Really Eat Her Lover's Head? What Do Roaches and Praying Mantids Have in Common? I Found a Huge Black and Yellow Spider—What Is It?